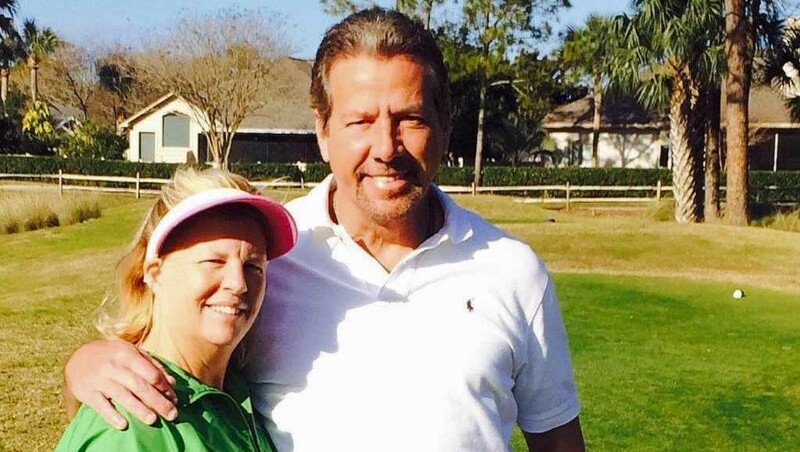 Mayo Clinic patient Donald Jones, of Ponte Vedra, Florida, with his wife, Beth. When 53-year-old Donald Jones of Ponte Vedra, Florida, found out he had lung cancer, the former smoker accepted it as a challenge that he was prepared to fight and win. Little did he know the other serious health issues that lay ahead, which would create serious new challenges for him over the next year. An avid golfer and hiker, Donald could tell something wasn’t right with his breathing after a hiking trip to the Smoky Mountains in 2013. A visit to his physician resulted in tests that showed a spot on his lung. It was cancer. He called Mayo Clinic for an appointment with a pulmonologist. There, he was told he’d need surgery to remove the lung tumor. For about three months after the surgery, everything seemed fine, and he was fortunate not to require additional radiation or chemotherapy to prevent recurrence of his cancer. What came next began a series of medical events that would threaten even the most optimistic patient’s resolve. During an employee engagement session at his job at CSX railroad, Donald noticed that along with a headache, he began having some speech difficulties, including missed and transposed words. He knew something was wrong and thought he might be having the early signs of a stroke. He went back to Mayo Clinic for some brain scans and the news wasn’t good. He had a brain tumor. As he began to accept the latest news about his health and think about his treatment options, a Saturday afternoon golf outing turned into his next medical crisis. While on the golf course with his wife, Donald began to experience dizziness, depth perception issues, and an extreme headache. A 911 call and trip to the Emergency Department at Mayo Clinic revealed he was having a seizure resulting from the pressure from the tumor on his brain. But then, during the hustle and bustle of his treatment in the ER, he says something very strange happened. As Donald was lying there in a trance-like state, he recollected a childhood memory from his time at Chesapeake Bay in Maryland. “I suddenly felt immersed in a bright light, and things became clear as a bell," he says. "I could suddenly speak again and remember the names of my loved ones at my side, and felt a sense of peace and calm." Jones had surgery to remove his brain tumor, which had been affecting the portion of his brain that controlled speech. His follow-up appointments involved discussions of his treatment plan, which included radiation therapy and chemotherapy to prevent a recurrence of this cancer. After months of treatment, PET scans suggested that all seemed well. But he wasn’t done with his health battles just yet. Four months after completion of this brain surgery and post-operative treatment, Jones ended up back in the emergency room with extreme pain and discoloration in his legs. He was diagnosed with an extreme case of cellulitis and was admitted to the hospital for two weeks. Even after he was discharged, it took several months of ongoing therapy to treat and control his cellulitis, which, left uncontrolled, could have cost him his leg. Donald is currently writing a book about his medical journey with the hope that it will help others facing their own life-threatening medical conditions remain optimistic. Learn more about lung cancer and brain cancer . Learn about cancer treatment options at Mayo Clinic.